My first encounter with a kit fox took place while I was leading a sunset/moonrise hike on the Mesquite Sand Dunes in Death Valley National Park. I caught a flash of movement in the gathering dusk. Putting up one hand to get my people to stop and pointing with the other, I tried to ascertain just what I was seeing. It was moving fast, in and out of the dunes and creosote bush. “Look, a kit fox”, I said. We tried to catch another glimpse. A women in my group, said, “No, that’s a rabbit!” Feeling pretty embarrassed as a guide and ranger to have made such a blatant misidentification, I whipped out my binoculars. “No, it’s both! It’s a kit fox chasing a jackrabbit!” It was the best wildlife sighting I ever had on the sand dunes, and really built up my ranger street cred with the visitors. While relatively shy, kit foxes are very curious, and after observing from a distance, sometimes approach people camping in the desert. Although seldom seen, the kit fox is not uncommon. A true desert dweller, they range throughout all of North America’s deserts, from southeastern Oregon to southwestern Colorado and on down into Mexico. They can be found in a vast variety of habitats, from sand dunes to creosote scrub, from grasslands to rocky canyons. Think of a Chihuahua in a fur coat. That’s a pretty apt description of the kit fox, the smallest canid in North America. Kit foxes are generally about 18 to 21 inches (455 to 535 millimeters) long and about 12 inches (300 milliimeters) high, the size of a small house cat. About one third of their body length is a long, luxurious tail. They weigh about 3 ½ to 6 pounds (1.5 to 3.5 kg). They have relatively short legs for the size and length of their bodies. Kit foxes have extremely large ears. Their hearing is so sensitive that they can hear a kangaroo rat moving underground in its burrow. Big ears help them hear, but serve another purpose, too. They are loaded with blood vessels that radiate body heat, aiding in regulating body temperature and helping the fox stay cool. They have extremely large eyes, also. The kit fox is mostly nocturnal. Large eyes gather more light and make it easier to see in the dark. I call them “ghost foxes” because their coloring makes them so difficult to spot, whether it’s day, night, or somewhere in between. A kit fox’s fur will be a mixture of white to grey to red to black. They are darker on top and lighter underneath. They are greyer in the winter and redder in the summer. Their multi-hued fur helps them to easily blend into their surroundings. The paws of a kit fox are padded with fur, even between the toes. This useful adaptation serves many purposes. It helps the fox “float” on the sand in much the same way as a lynx’s padded paws help it stay on top of the snow. It helps quiet the fox’s footsteps so it can be a more silent stalker. The furry paws also help protect delicate pads from the scorching hot ground. Kangaroo rats are a mainstay of the kit fox diet. They also eat jackrabbits, desert cottontails, pack rats, prairie dogs, mice, lizards, snakes, birds, insects – basically anything they can get their mouth on. They are omnivorous, and will eat fruits and some plants and seeds. It helps to be omnivorous if you live in a harsh environment where a good meal is hard to come by. Kit fox seldom if ever have to drink water; they get all the water they need from their prey. They need six ounces of prey a night to fill both their eating and drinking requirements. Kit foxes generally live five to eight years in the wild. They have lived up to 14 years in captivity. They are fast runners and can run up to 25 miles (40 km) an hour. Due to their small size, kit foxes are not only predators; they are prey to bigger animals and raptors. Their cousin the coyote is their greatest enemy. It has been estimated that 75% of kit fox mortality through predation is due to coyotes. Man also takes his toll on kit fox numbers. Road kill is a problem, especially with OHV vehicles. Loss of habitat is another way humans decimate kit foxes. 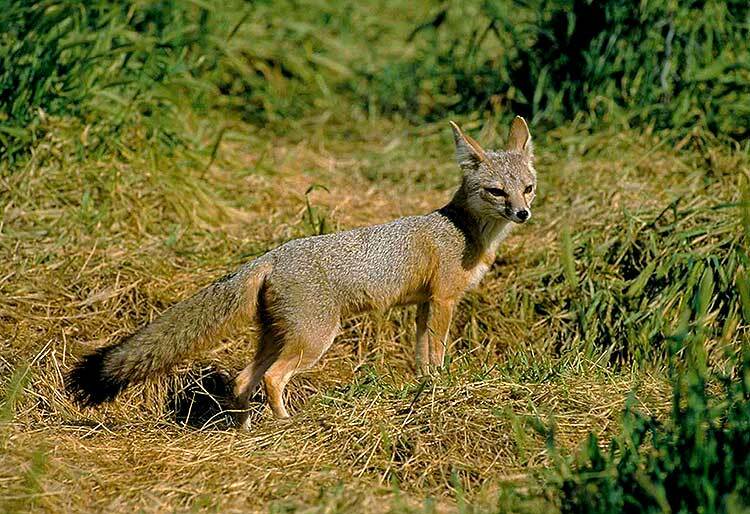 One subspecies of the kit fox, the San Joaquin kit fox, is on the Endangered Species List. The San Joaquin used to live all over the Central Valley of California, but due mainly to habitat loss, is now found in only a tiny fraction of its former range. Kit foxes are generally solitary unless its mating season or they are raising a family. They are not territorial, but prefer their space and will leave an area if they find signs that another is already there. Winter is mating season. Kit foxes are mostly (but not always) monogamous, and often mate for life. Babies are born from late February until early April. Litters range from one to seven pups, with an average of four. Both parents help raise the young. The mother stays with the babies while the father hunts for the family. Youngsters are weaned at about two months, but stay with their parents for about six months. It’s a steep learning curve and most don’t make it. Only one in four kit fox pups lives to adulthood. When it is time for them to leave home, kit fox pups wander far from their birthplace. They may disperse as far as 20 miles away! 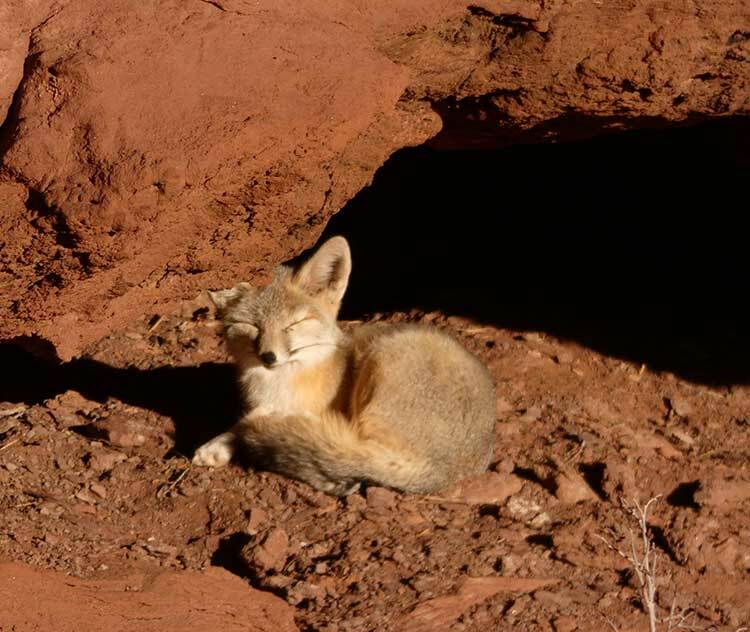 Kit foxes keep multiple dens with several different entrances and exits. Tunnels run 9 to 18 feet (3 to 6 meters) long underground. They rotate, moving to a new den often. This keeps the fleas down and the coyotes guessing. Similar animals fill the same niche in deserts all over the world. In the Sahara from North Africa to Arabia, it is filled by the fennec fox. The fennec is even smaller than the kit fox and has even bigger ears. Each ear is about a third of the size of the rest of its body! It is the smallest canid in the world, about 16 inches (42 cm) long including the tail. They weigh only two to three pounds (approx. 32-48 grams). In some parts of the world, fennecs are even kept as pets. I can see why, they are so adorable! The fennec shares many of the same adaptations as the kit fox, such as using those big ears to radiate heat, furry feet and getting their water from their prey.